Whoever is elected Maryland governor on Nov. 4 will have some s’plain’ to do to the state’s citizens. Why did you make wild allegations out of whole cloth? Why did you deceive us? Both Democrat Anthony Brown and Republican Larry Hogan Jr. are guilty as charged, though Brown is by far the worse offender. He not only manufactured false charges against Hogan on abortion, gun control and school construction, his campaign has kept screaming those invalid accusations in a propaganda blitz dominated by “Big Lie” tactics. Brown continued his campaign of falsehoods at the first TV debate last week. Out of the blue he accused Hogan of pledging to cut $450 million from school construction funds. That is patently false. Hogan never said any such thing. Hogan had issued an error-filled list of “examples,” culled from audit reports, of “waste, fraud and abuse” in state government, including school construction, to show how cost-savings could be achieved. Brown’s advisers turned that into “he’s against education” allegations. Then Brown repeated the bogus charge in the debate. Talk about a leap of logic. . . Even more shameful: Brown got both the state teachers’ union and House Speaker Mike Busch to condemn a budget-cut promise by Hogan that he never made. Busch and the union know better. They are contributing to a dangerous, inflammatory campaign environment in which truth is the casualty. 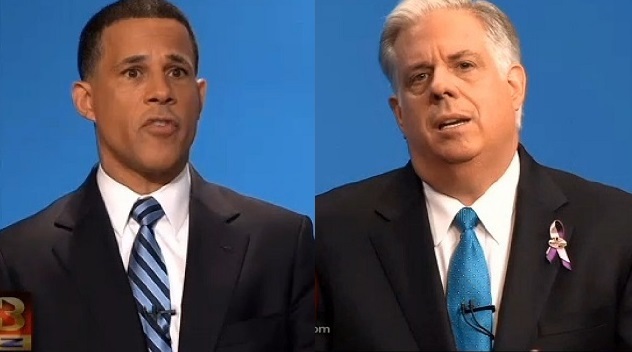 Instead of setting a positive tone in the debate and detailing his positions, Brown stuck to his advisers’ script: go negative, denounce Hogan, keep him on the defensive — even if the charges aren’t true. What an appalling way to win an election. It’s the worst “Big Lie” campaign in Maryland since John Marshall Butler defeated longtime Sen. Millard Tydings in 1950 — during the height of the Red Scare era — by distributing a doctored, composite photo showing Tydings with the leader of the American Communist Party. This end-justifies-the-means mentality is deeply offensive in a democratic arena. It may work on the battlefield, but Army Colonel Brown knows it is totally inappropriate in an American political campaign. Not that Hogan’s antics deserve a silver star. His much-ballyhooed attack on the Democratic administration’s “40 tax increases” is wildly inflated. His $1.75 billion listing of “waste, fraud and abuse” is irresponsibly inaccurate and filled with stunning errors. His misleading attacks on the “rain tax” perpetuate a Republican fiction. His data to prove Maryland’s economic decline badly overstates reality. What’s lacking from both candidates is a compelling, detailed argument for why they should be governor. Instead, we get finger-pointing and shrill, over-the-top charges of extremism. This campaign has been about extremism — extreme name-calling. And it’s worth reiterating that Brown is doing far more than Hogan to put this campaign in Maryland’s Political Hall of Shame. Recently, Brown issued his own cost-cutting, “government efficiency” program, making sure it was released on a football Sunday, guaranteeing that few paid attention. It’s a disgraceful document, nearly as bad as Hogan’s much-discredited budget-cutting plan. It assumes future savings that may never materialize. It makes giant leaps of faith that aren’t supported by any credible documentation. It incorrectly counts savings by local governments as state budget savings. It makes wild assumptions that employee suggestions will save tens of millions of dollars each year. It attributes huge savings to decriminalizing marijuana — a flight of fantasy lacking in hard evidence. Given all the fraudulent assertions by each candidate, neither deserves to move into the governor’s mansion. But that’s not an option for voters. We’re left picking between the lesser of two evils. What a sad commentary on the current state of Maryland politics. Barry Rascovar’s commentaries can be found at www.politicalmaryland.com. He can be reached at brascovar@hotmail.com.